Post about Nostalgia & Comics hitting 30. Clicked through to have a look at Spleenal's blog. Well worth a good look. 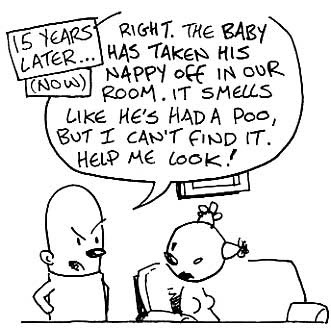 Lots of great cartoons, nasty sense of lost possibilities / parental / comic humour going on. Then a little more digging and a name and a graphic novel spring out: Gone by Nigel Auchterlounie, review here. I can remember this coming into Nostalgia & Comics back in 2003 (I think). It was a great little book, nicely strange. Funny how things come round isn't it?